This may e a few days old but the BBC reported that astronomers have smashed the record for the smallest exoplanet beyond our Solar - finding one only slightly larger than our Moon. To spot the tiny, probably rocky planet, they first needed to precisely measure the size of its host star. They did so using "astroseismology" - effectively, turning tiny variations in the star's light into sounds. A report in Nature describes the blistering, probably rocky planet, which orbits its star in just 13 days. It is joined in this far-flung solar system by two other planets, one three-quarters Earth's size and one twice as large as Earth - all circling their star too closely to harbour liquid water or life. Moving target The record for smallest "exoplanet" is routinely being broken, as astronomers get better and better at finding them. The best tool in the planet-hunters' toolbox is the Kepler space telescope, which stares at a fixed part of the sky, trying to detect the tiny dips in stars' light that happens when planets pass in front of them: what is called a transit event. In its earliest days, the Kepler team tended to find large planets - Jupiter- and Neptune-sized behemoths. In more recent years, the catalogue of exoplanet has seen an increasing number of so-called super-Earths, up to about twice the radius of our planet.But the new find is a planet just a third the size of that recent record-holder, smaller even than our Solar System's smallest planet, Mercury. "I think it's an amazing technological achievement to be able to be able to detect small rocks like this," said Francois Fressin, a co-author of the paper based at the Harvard-Smithsonian Center for Astrophysics. It means we're really in the arena where it's possible to detect all the planets of our Solar System, but around other stars," he told BBC News. 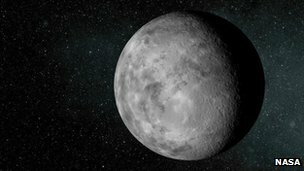 The find of Kepler 37b and its two companions can in part be ascribed to a wealth of data from the Kepler telescope; it has been recording data for nearly four years, and signals that would once have been too small to see have been slowly accumulating, with smaller planets becoming more apparent. But telling just how small a given planet is depends on a relative measurement: how much light there is when the planet is and is not in front of the host star. The degree to which we can know the planet's size depends on how well we can know the host star's size. That is where the science of astroseismology comes in - and a team of experts in this area of science at the University of Birmingham in the UK took a look at the data. "Inside stars it's a very noisy environment, and that noise sets up sound waves that travel all the way through the star," said Birmingham astrophysicist Prof Yvonne Elsworth. "Some of (the waves) will resonate, just like a musical instrument - the turbulence causes them to ring at frequencies that are characteristic of the star," Prof Elsworth told BBC News. "If we look at the star we can see those oscillations, the amount of light we get from the star varies - slowly and by a very small amount - at frequencies that tell us what's going on inside the star." And also like a musical instrument, those "resonant" frequencies tell researchers just how big the star actually is. 'Decade of discovery' Together, the analyses point to the presence of three planets. Kepler 37b and c are about 30% and 74% as large as the Earth, and Kepler 37d is about twice Earth's radius. The three orbit their star in 13, 21, and 40 days respectively - all within orbits just 20% of the Earth-Sun distance. It is, in short, another interesting solar system to go in the burgeoning catalogues of exoplanets - and the notion that exoplanet news has been in plentiful supply in recent years is not lost on Dr Fressin. "I understand that people could get bored by these successive announcements," he said. "But hundreds or thousands of years from now, this will be remembered as the decade where discovery of other worlds of all kinds has been made possible." It's an artist's impression. Perhaps Aileen can help! I have to laugh at why they bother with these "artist's impressions". My point being... they don't even know that it is "rocky", they don't know what colour it is, or whether or not it is significantly cratered, or if it has an atmosphere or... nothing. So what's the bleedin' point in getting an artist to draw an "impression" of a (just presumably) spherical thing we know nothing about? And I have known quite sensible people to confuse these meaningless impressions with real photographs, since they skim the news so quickly. They are a joke. And anyway, Aileen says the funny thing is that this particular "planet" is actually a square box containing all the discarded soft cuddly toys collected from all over the galaxy. "Think of that box up in your loft, Andrew, just on a much bigger scale" she said. and cuddly Octaplods, Tentacusps, Snakeyslugs, Spiderhugs, Brainsuckers, Crustycrabs and much, much more besides, apparently. The stuff of dreams and nightmares too... Your imagination can draw an artist's impression for you.